Portsmouth Herald publishes United Poultry Concerns' letter, airs our concerns May 25. "Strawbery Banke Museum has 12 hens for its reproduction 1940s chicken coop for its historic poultry exhibit. Two popular heritage breeds of chickens common to American farms, the Rhode Island red and the Australorp, were introduced to America in the late 19th century and both are excellent egg layers." Our letter was preceded by a newspaper article that related many of the concerns we expressed to the City Council, and our Letter to the Editor was published in full on Memorial Day, for which we thank the Portsmouth Herald. On behalf of United Poultry Concerns, I am writing at the request of residents whose concerns we share about the Portsmouth Board of Adjustment's vote to allow Strawbery Banke Museum to keep a small flock of hens as part of a "historic poultry exhibition." We respectfully urge that this exhibit be conducted with historic films and other features that convey the history without live birds. Contrary to the beliefs of some, chickens kept in coops require daily labor and care. What looks like an idyllic pastime becomes an unwelcome burden if care is not taken initially to ensure responsible husbandry practices. Chickens need predator-proof housing and yards with nest areas, roosts and natural sunlight. Their living quarters require daily cleaning and maintenance, yet even the cleanest coop attracts rodents to the free food and straw bedding. Moreover, chickens need to be treated with respect and compassion. They have feelings, they are companionable creatures, and it is not right to relegate them to the role of specimens. A few years ago I visited an exhibit similar in purpose to this one where the chickens were kept in insanitary conditions and covered with lice and mites. Their food and water bowls were unclean and their housing was barren. They were unhealthy and unhappy. The museum manager said, "This is how they did it back in the old days." In traditional farming, chickens seldom received veterinary care, but in today's world it is imperative that chickens have access to reliable veterinary care. Also disturbing is the fact that for every hen purchased, a rooster was born who was ground up alive, gassed or suffocated to death in plastic garbage bags. Hen-keeping without roosters is neither natural nor traditional. This practice has become a fad in recent years as part of an idea about "returning to nature" or to some fantasized "tradition" by incongruously ordering hens from industrial hatcheries. 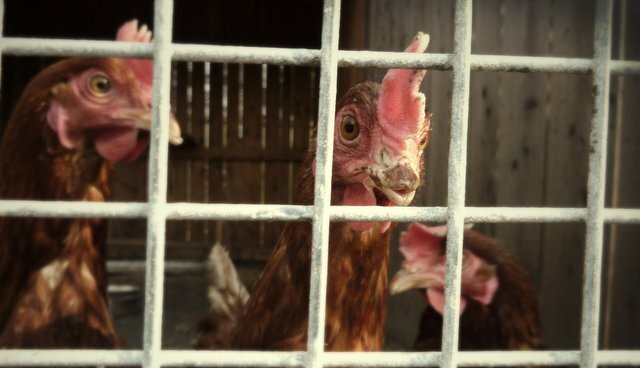 Out of concern for the hens and opposition to the perpetuation of demeaning ideas about chickens that treating them as museum specimens entails, we respectfully ask that the Portsmouth City Council reconsider allowing chickens to be kept by Strawbery Banke Museum. The story the museum wishes to tell can be told without live chickens. The story of chickens that needs to be told is that they are friendly, intelligent, sociable birds with cheerful spirits who love sunlight and soil, fresh breezes and light rain, and lots of daily activity and exploration. Chickens have excellent eyesight and hearing, and they are very sensitive to the attitudes of the people around them. They are not meant for harsh temperatures or callous treatment. Unfortunately, that kind of treatment often reflects a farming attitude that we fear could be carried over into the museum exhibit and transmitted to the public. Hopefully the City Council can come up with other, more creative ways of recapturing the past, and let chickens be chickens on their own terms and for their own sakes.